This page is dedicated to some of my favorite musicians and instrument makers. Some of them have been my personal friends. Others are relatives of friends of mine. Most of them emigrated to the United States or Australia. All of them have my deepest respect. I have their pictures here in order to honor them and their art, and to show appreciation for the joy they brought to so many people during their lives. 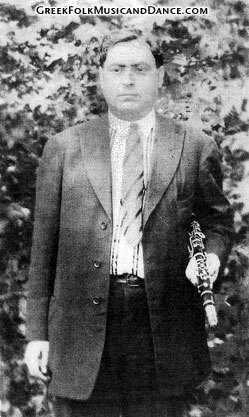 Singer of dimotika and rebetika; Guitarist. 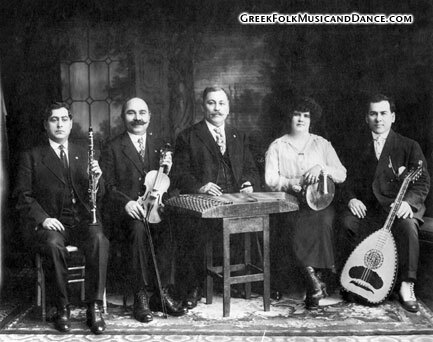 Top left: Athanasios Evgenikos and Papaioannou, bouzouki; Kallergis, guitar, and unknown. 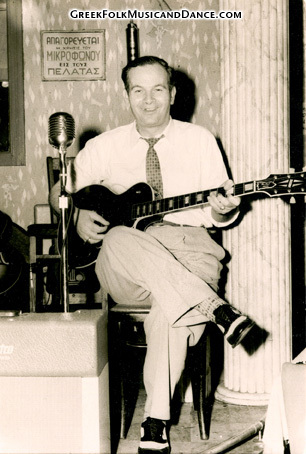 Above: Athanasios Evgenikos with guitar. 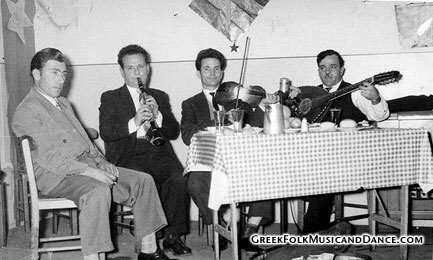 Bottom left: C. 1949 at the taverna Kalamatianou. 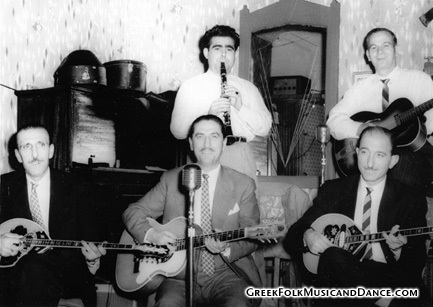 Athanasios Evgenikos and Mihalis Genitsaris, bouzouki; Rovertakis; Panayiotis Sarikas, bouzouki. All Photos courtesy of the Evgenikos Family. 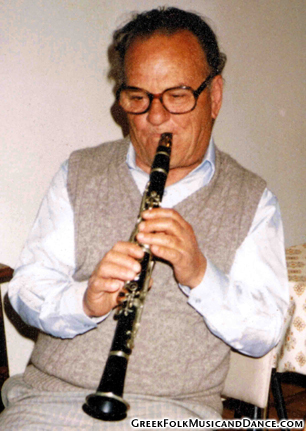 Born 1917 in Kefalovriso ("Panobellesi"). Emigrated to Australia in 1954. His name was Epaminondas Kapetanos, but everyone called him Panoyianni after the names of his village and his father's name. He was born in 1917 in Kefalovriso as it is now called. The older name of the village was Panobellesi. 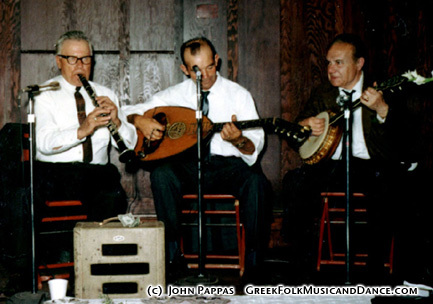 Top Left: Epaminondas Kapetanos with his band. Middle Left: Playing with his koumbaro. 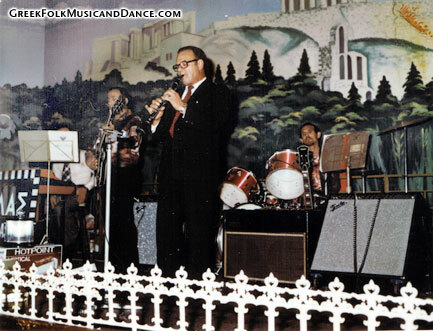 Bottom Left: With his band at Olympic Hall, Adelaide, Australia. Photos courtesy George Kapetanos (son). Born in village of Parapoungia (Parapouggia) near Thivai, Greece, in 1884. Above: With his band, ca. 1919. Photos courtesy Athanasios "Tom" Karelis (nephew). Recorded several times as singer and also as a klarino player. Top and Bottom Left: August 17, 1968, John and Paula Pappas wedding; San Francisco, California. 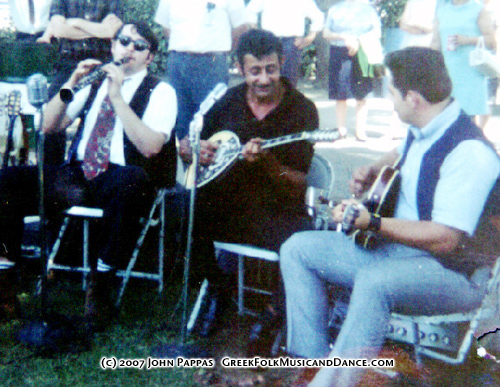 Dimitris Surmelis, klarino; Anastasios Rigopoulos, lavouto; "Emeneff," banjo. 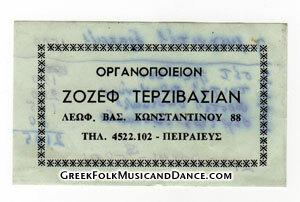 Greatest bouzouki maker of his time. 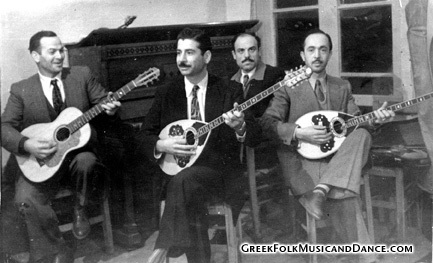 All the great bouzouki players of the mid-twentieth century used Zozef's creations. He was such an amazing instrument architect that Hohner Accordions asked him - no applications, no official training, no certifications - to be one of their premier repair reps. It was Zozef who gave John the nickname "Daskalos." 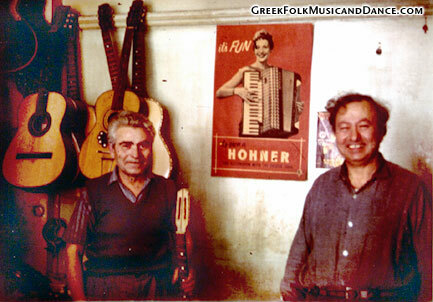 Above: Zozef (right), the Stradivari of bouzouki makers, with assistant Pandelis (left, holding instrument); ca. 1965. Right: These two bouzoukia show some of the artistry of Zozef Terzivasian. The first one is a cheaper model. The second one is older and is a more deluxe model. 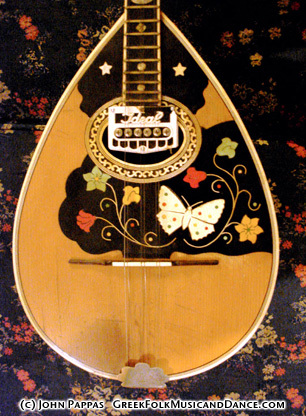 "Petalouda" (butterfly) bouzouki, top right: Made by Zozef Terzivasian around 1964; bought from Iordanis Tsomides in 1965. Pandelis also worked on it. Walnut back ("skafos"). 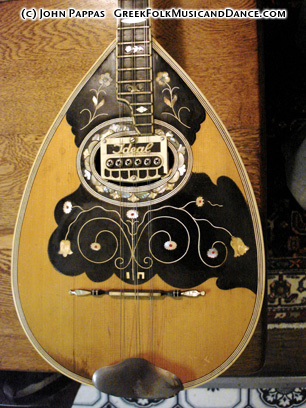 "Papaioannou" bouzouki, bottom right: Made by Zozef Terzivasian around c.1940; ebony back ("skafos") with inlays on sides and bottom. Made for Ioannis Papaioannou, and has his initials on the pick guard ("pasta"). Bought from Zozef in 1970. It has a longer than normal scale length. 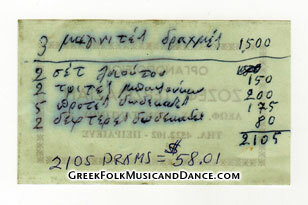 Below: One of Zozef's instrument labels, used as a receipt; 1971. Iordanis Tsomides (1933-2006) was born in Kokkinia, Peiraieus. 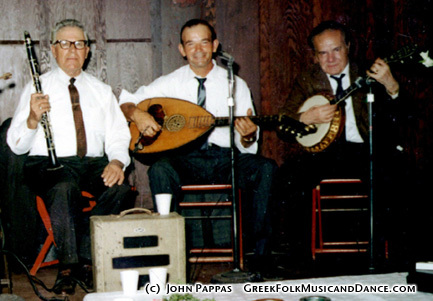 He started to learn the bouzouki when he was about 12 years old. 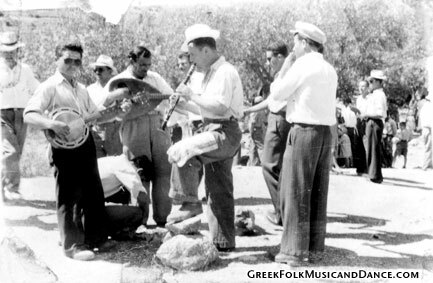 Bouzouki/rebetika afficianados considered him to be one of the most creative bouzouki players. He was famous for his “taximi” improvisations. 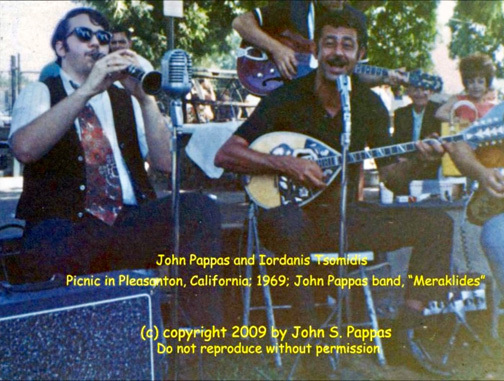 His fellow musicians often said that Iordanis’s taximia were legendary fantasies. He would create improvisational melodies in the “dromo” (mode) of a song and never repeat a musical phrase. I had the honor of playing with him many many times, and he was the best musician I have ever known.